On an exclusive report we can reveal that Maruti Suzuki’s Dealer has launched the special edition ‘Kabali’ version of its popular compact hatchback Swift. As I would hope most of you had known, Kabali is a Tamil film featuring world-renowned Rajinikanth as the lead actor. The highly anticipated movie for Kollywood fans has been scheduled to release on June 22. 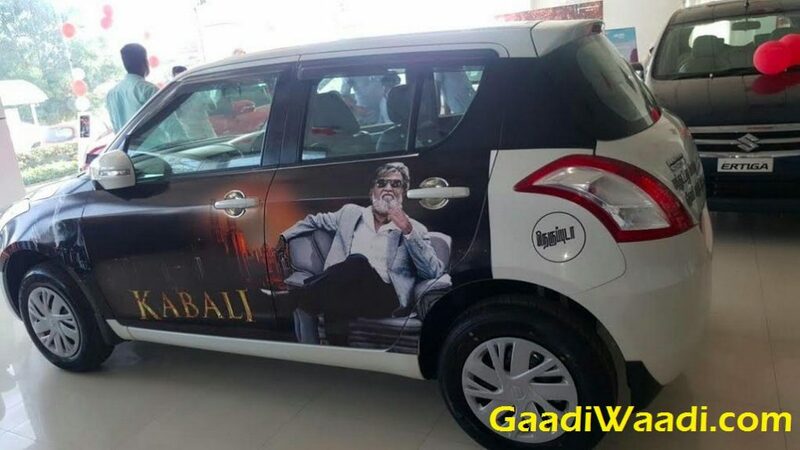 With just few days away from the grand showcase, it appears that everyone’s jumping in the bandwagon to sell their respective products through Kabali promotions. The release of Kabali, or any Rajinikanth film for that matter, is like a national holiday in Tamil Nadu. Such is the craze that if you get the tickets on the first day of screening, it’s a huge accomplishment (let alone I’m trying hardest as ever). When the Kabali teaser was released on May 1, it crossed five million views on Youtube in just 22 hours setting a new Indian film industry record previously held by Dhoom 3 and Sultan movies for most number of views. It will inexplicably send nostalgia to the classic Rajinikanth movies as a larger-than-life gangster. Releasing in Tamil, Telugu and Hindi across 5,000 plus screens worldwide, around 500 screens in the US, the producer is expecting the movie to make over Rs. 500 crore – bigger than the blockbuster Baahubali. Lately AirAsia, the official airline partner, adorned its passenger carrier with the Kabali theme. It’s for the fanatics across the world flying to see the movie on its release date according to them. Leading into the release on July 22, exclusive Kabali recharge packs like unlimited 2G internet, hello tunes and even Kabali branded SIM cards have been launched by Airtel. 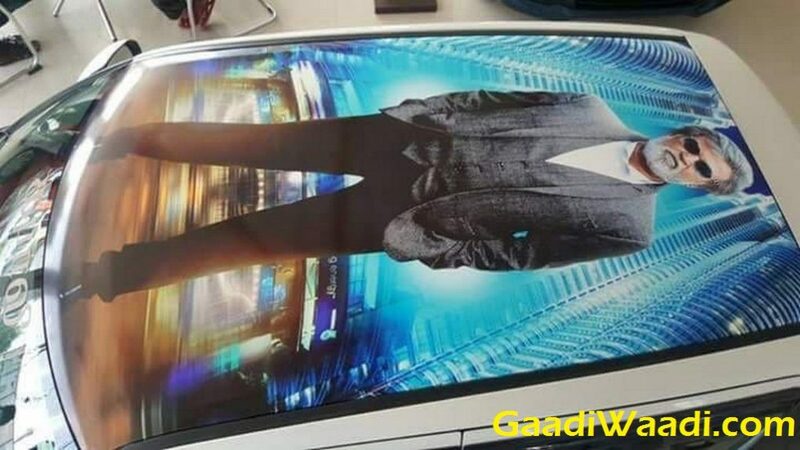 Kabali merchandise like T-shirts and coffee mugs are selling on demand in the Southern states too. 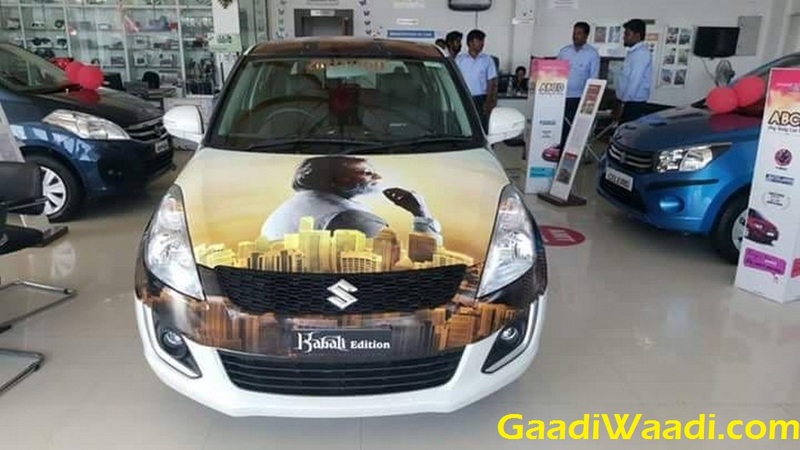 With the online bookings opened in some multiplexes sold out in no time today, Maruti Suzuki has fuelled up the enthusiasm with the special edition Swift paying hommage to Kabali – directed by the highly capable Pa. Ranjith. 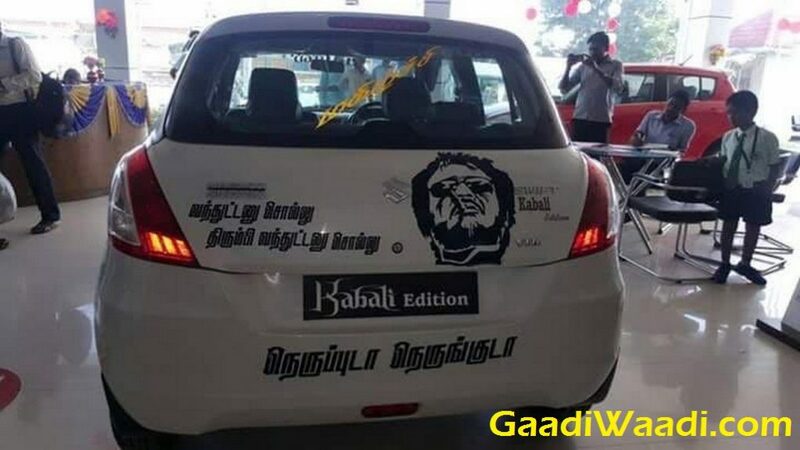 The roof, side profile and bonnet have Rajinikanth, fondly known as Super Star, vinyl wrap stickers with the registration plate at front displaying the letters ‘Kabali Edition’. At the rear, the Tamil wording ‘Nerrupuda Nerrunguda’ is from the exhilarating theme song and above which the famous dialogue from the teaser marking his return as a gangster. The glass on the rear hatch bears his signature ‘Maghilchi’ dialogue as well. No mechanical changes are intended as it’s purely a celebration for the release of the movie.